Every year the Press publishes a list of the top Long Island stories of the year—which we did again this year—among other end-of-the-year delights. But in this social media-obsessed age we figured to add another stocking stuffer—yeah, we tend to be late with gifts—to your collection of news-related presents, dear reader. So in the spirit of the New Year and our always-confounding digital age, we give you the top 10 Long Island Reddit stories. A piece of advice: Prepare yourselves, folks, this list may be unlike any other listicle (another name for pseudo-journalism) you’ve ever seen. If you’re familiar with Reddit, the shock value may be considerably less overwhelming. In any event, it’s interesting to view Long Island through the lens of social media, where the most serious stories get buried in constantly changing algorithms, and where easily digestible pleasure pieces—like bite-sized pieces of blueberry pie—rule the day. 9. A problem gripping bagel connoisseurs everywhere. (Disclaimer: By “everywhere” we mean New York—downstate NY, specifically. No such person exists anywhere else on the planet.) In what amounts to a near catastrophe, this Reddit user posted a bagel with the caption “Light on the cream cheese, please.” Of course, the kind employee behind the counter did the total opposite and stuffed that baby like a turkey on Thanksgiving. Indeed, the struggle is real. 8. Sometimes people just don’t give an F. A photo of a woman pumping gas wouldn’t usually inspire thousands of views, but this one did. 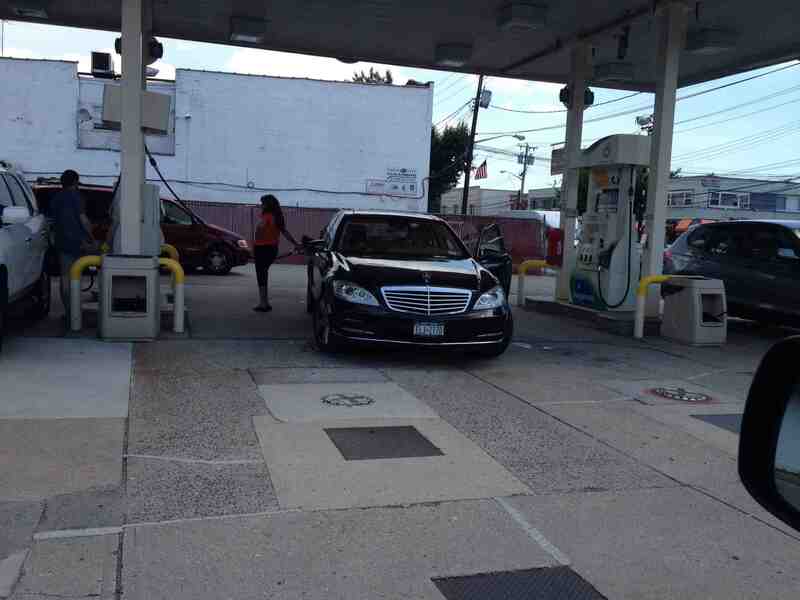 A woman in red, or orange, it doesn’t matter, parked her Mercedes in between two pumps, making it nearly impossible for any other vehicle to fit. It’s like when you’re at Roosevelt Field Mall and you’re delighted at what appears to be an open spot, only to discover it’s a tease because some other idiot encroached on the neighboring spot. And people wonder why road rage is a thing. 7. We don’t know what to make of this one. Seriously, just click on the damn link. 6. Apparently meme’s rule everything around us—and so does the Long Island Rail Road. Alas, this won’t be the only LIRR-related complaint you see in this list. 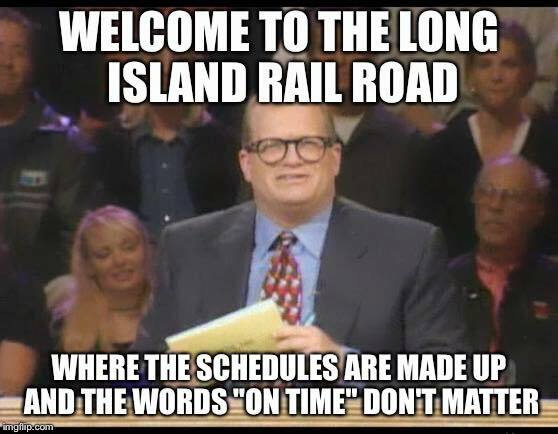 One LIRR rider was so fed up he/she grabbed a photo of Drew Carey from Whose Line is it Anyway with the words: “Welcome to the Long Island Rail Road, where the schedules are made up and the words ‘on time’ don’t matter. Why act this one out when you can just head over to the nearest train station and experience this all-too common occurrence first hand? 5. Kids. F’n kids. One Reddit user captured apparent Farmingdale High School seniors littering the hell out of Tobay Beach one day in May and was so incensed they captioned the photo: “Farmingdale HS Seniors are a F@$king Disgrace.” That may be a bit harsh, but disposing of your Solo cups all over our precious beaches is environmental cruelty personified. 4. Stereotypes abound with this one. 3. We’re LMFAO-ing over here. We’ve all been stuck behind drivers who fail to signal—or equally infuriating, leave their signal on after completing the act of switching lanes—and pounded at our dashboard. Try switching your turn signal on and off, folks. 1. You guessed it: It’s the LIRR. The top LI Reddit post of 2016 is a gif of a wobbly Johnny Depp from Pirates of the Caribbean waddling off screen. The caption: “MRW (my reaction when) I’m in Penn Station and I’m waiting for the platform number to generate for the LIRR at 5 p.m.” We’ve all been there.